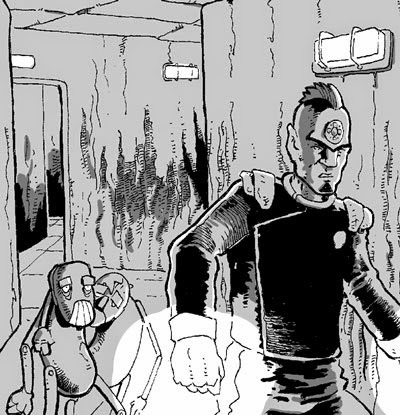 Coming soon to the pages of Zarjaz- Tharg the Mighty in Escape from Sanitys Edge. Witness the never before told tale of The Mighty One’s assault on the most heavily guarded prison in the sector. Why does he do it? What are those droids doing and why has it taken so long for a Tharg strip to appear in Zarjaz? Writer River Apparicio and Artist Bolt-01 will tell you. The Ripper Legacy by Jim Alexander and Mark Bloodworth published by Caliber. Imagine a setting where Eve taking the bite of the apple and Cain killing Abel release a palpable force for evil that wants to perpetrate itself upon the human race. Fast forward to Whitechapel in 1888 and this force gains a name for itself- The Ripper Legacy. Fast forward to the ’90’s (when the book was written) and the involvement of the Raven Inc; a group of investigators that specialise in the cases that conventional agencies cannot solve. Anything more would be a spoiler so I’ll stop there and let you know that this tale, originally published as a three part mini-series is now available from Drivethru comics ($4.99) and also from Amazon (£3.71) and Comixology (£3.99) as a digital download. I really enjoyed this book, the artwork is clear and unfussed- there are a few storytelling issues that resulted in headaches for the the letterer, but on the whole this is a solid story told well. To say more would- in my opinion- detract from the quality of the story. Thanks to Jim for the review pdf. Coming soon to the pages of Dogbreath- The Wreck- written by Richmond Clements and with artwork provided by John Charles. It is rare for Dogbreath to have a colour centrespread, and when you see the work you’ll understand why. On sale in Dogbreath 29- available November 2014. Join writer David McCluskey and artist Scott Twells as they present ‘The Fifty Yard Fox’ for Something Wicked. A tale of love at first sight as only FQP can tell it. Available soon in Something Wicked issue 10. Higher Power is by writer Alec Charles and features astounding artwork by Barry Renshaw. 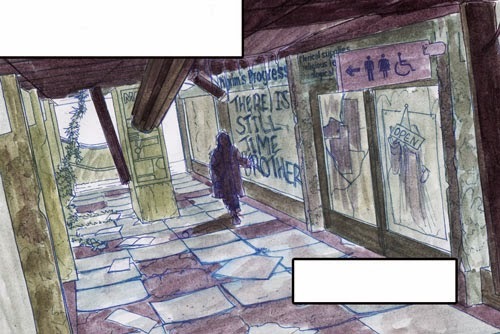 The strip will be appearing on the back cover of FQ26, on sale in early 2015. Coming Soon- Strontium Dogs- The first day. Meet Stel, Rab and Urb. Three brand spanking new puppies on their first day in the Doghouse. Join writer Matt Sharp and artist David Broughton as they show us some of the processes and procedures followed by all new agents working for the GCC. 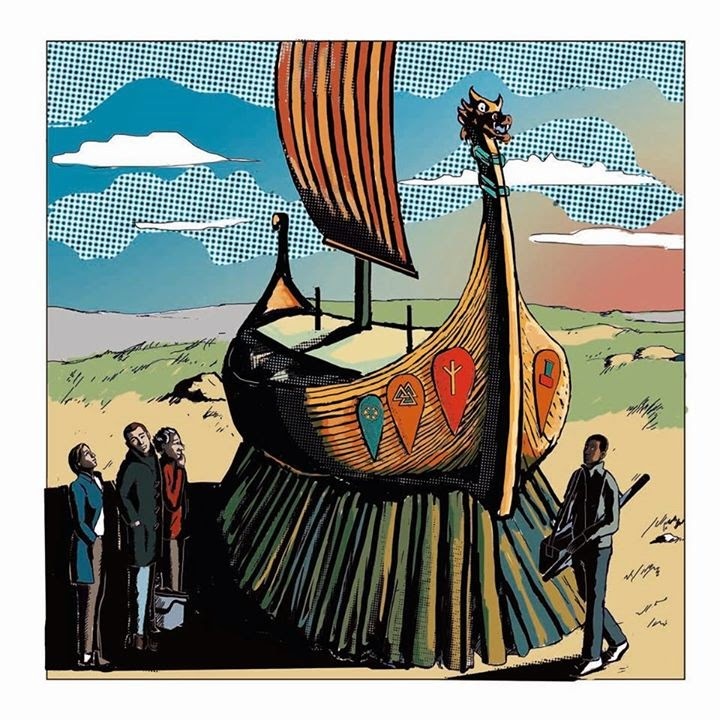 Longship by Lawrence Rider and Rebecca Teall, published by Timebomb comics. Lawrence Rider wrote Consumer Channel X for FQ25, a tale of excess, morbidity and bizarre logic. 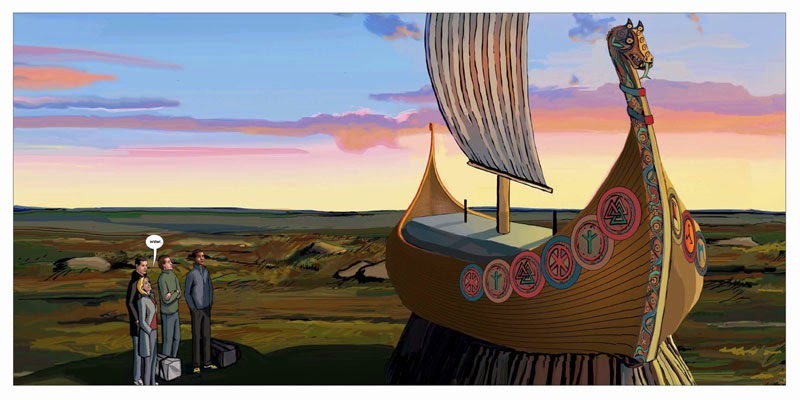 So what should I make of a book called Longship? Well, the simple answer is do not come to this with any preconceptions. I’m really trying to find words to say what this book is about without actually telling you anything spoilery; which is how I came to the book. The plot (such as I can say) involves a Longship- Viking style and the story of how it was built and where it came to be. That’s about all I can say without spoilers. The script by Lawrence is paced wonderfully. This book runs to 49 pages of strip and Lawrence uses that space to capture mood, time and for me a lovely moment of realisation. The art (and lettering) by Rebecca Teall is beautifully suited to the style of the story and her storytelling and sense of pace is used to great effect in the ‘quiet’ moments of the book. My final thoughts? I wish that everyone who wants to read this book does so without flicking through the pages. The more of this tale you are unaware of, the more of a delight it will be. Thanks to Lawrence for sending me a copy of the digital edition to read. I picked up a copy of the book at ICE2014 and the presentation of the book is as good as I wanted it to be. A welcome addition to the increasingly rare physical comics collection I have. … and the final version of the same. The softback is available to order through the Time Bomb website (£7.99 + £3 postage to UK addresses) and they have a handful of the signed, limited edition hardbacks left. The latter are £18 inc postage but also include a free exclusive print – anyone wanting those should contact sales@timebombcomic.com to confirm availability. Zarjaz & Dogbreath Need YOU! Script Submissions closing this week-Reminder! Stocks Away! FQ2019 in the post!